For a new blogger, this seems like a huge mountain to climb. But, it doesn’t have to be. I own several blogs, and I use the same blog traffic recipe to increase my website traffic. And, Twins Mommy helps bloggers like you learn how to grow their blog. By using simple strategies, over time, you can increase website traffic by over 100%. 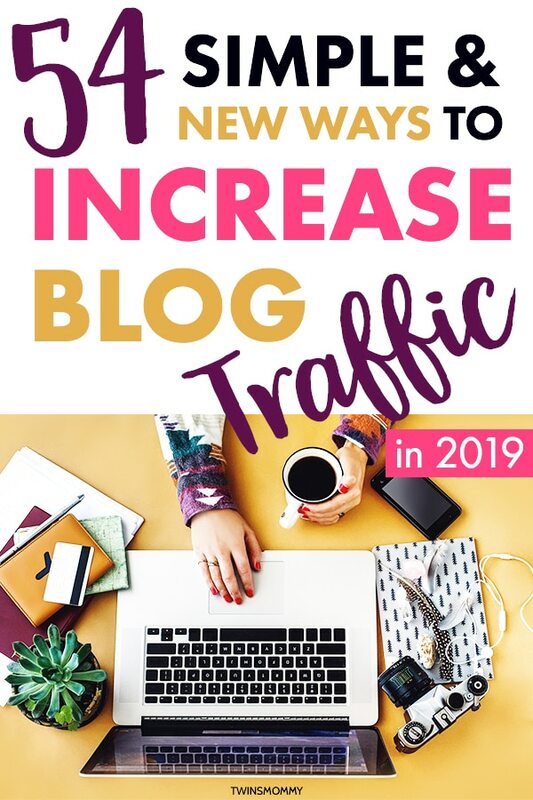 So, I thought I would lay out the ultimate guide to the right strategies for growing your blog traffic in 2019. If your blog can cover these aspects, you will see improvement in more readers, more subscribers, and more income. But, first, let’s go over the simple ways you can get started to increase website traffic. I have used these tips for my blogs, and I have proof that these tips work. I can’t guarantee that if you adopt all 54 strategies that you’ll see a bump in traffic. But, I can bet that you will! All of these tips are free (except for one! ), and most are non-tech (except for one or two!). A simple tweak to boost rankings on your blog posts is to list the last updated date, rather than the published date. Gael of Authority Hacker ran a test to see if doing this one thing can help with traffic building, and it did. He used it on an older popular post that was slowly dwindling on search traffic. So he adopted the last updated date, and traffic bumped up to the prior traffic stats for that popular post. And a lot of other blogs feel the same. 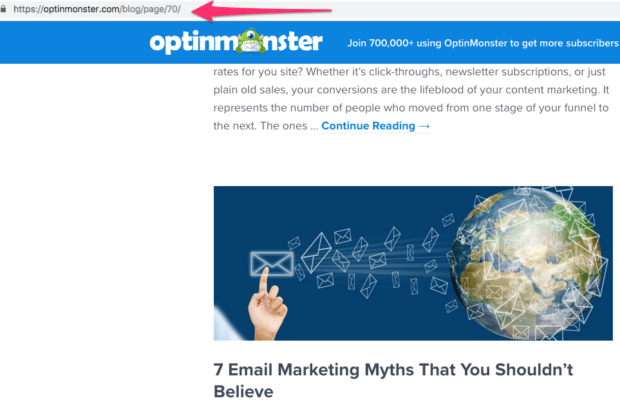 When the New Year hit, Optinmonster updated the date of all their blog content, spanning 70+ pages. But, when you click on it, it’s been updated! Along with the last updated date, it’s a good practice actually to update your post. Later on, I will talk more about how to update old blog posts. So, how do you list the last updated date? There are two ways – the harder way and the easier way! The harder way involves coding, and it’s specific to ONLY Genesis WordPress themes. The simpler way is to install a free WordPress plugin called WP Last Modified Info. After it’s installed, go to the settings for the plugin, then to Posts and enable the function and decide where you want to place the updated date. I chose before the content. One thing to remember is if you are using a theme where you can enable and disable the published date, you will have to disable the published date. From there, on the side of your blog post, you can put in the last updated date of when you updated your post! I think the online audience is losing attention more and more as the years go by. Maybe it’s me! I’m a mom, a blogger and a freelance writer. I only have a small block of time to write a whole bunch of blog posts for my four or five (soon to be six) blogs, manage my two contributor blogs, write emails to my two lists and write client pieces. So, when I have the small blip of time to read for enjoyment other mom blog posts, I end up skimming them. I quickly see if it’s for me. Is there something in this post that’s worth it for me? 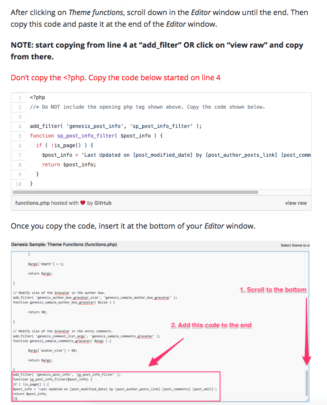 But, this changes if I land on a blog post that has a larger font with a well-spaced line height. It holds my attention and makes me enjoy reading that blog post. Ad network Mediavine mentions that increasing your font size will help with ranking in SEO due to Google using mobile-first indexing. Most default theme font sizes are around 12px. 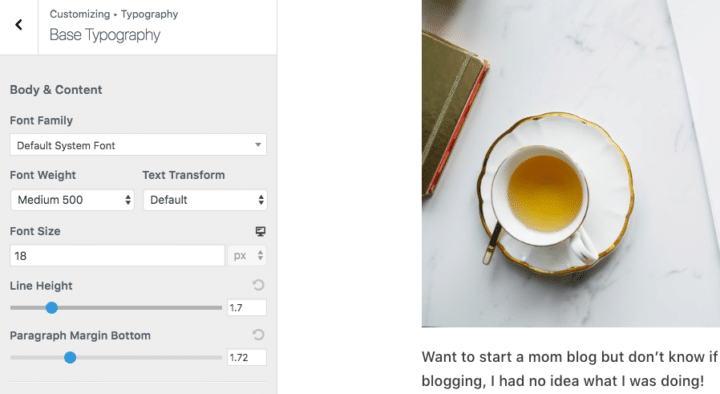 Based on your theme settings, you can change the font size for all of your blog or just your blog content. I have my Twins Mommy’s font size set at 18px. When you increase your font size, also increase the line height. This is the spacing between your sentences. My line height is 1.6. You can go higher to 1.7 as well. So, check to see if your theme has something similar. Some big blogs stopped enabling comments on their blog. For example, Scary Mommy or Pop Sugar no longer have blog comments. Some bloggers feel that mining comments is a full-time job, even with anti-spam systems like Akismet. Others may have blogs with low engagement, so it just makes sense to remove that part of their blog. But, personally, I love blog comments. They can make you more authentic, show a personal side of you and help you understand your audience better. Another helpful thing about blog comments is that comments on your blog can help with SEO and ranking. But, this tip is about YOU commenting on other blogs. A way to bring more clicks to your blog from commenting is to use your blog name when you leave a comment. This ups the curiosity for other commenters and blog owner and it helps brand your website and make you more credible in your niche. And big bloggers agree that blog comments are a rich source of content on your blog. You might be thinking, why would I want returning visitors to help me grow my blog traffic when new visitors can help me grow my email list and more? Well, I feel that your invested tribe of followers need nurturing at all times. They are the ones that are most invested in you. And if your email can drive clicks and views to your blog, why not use that? I love sharing my tips and telling my subscribers what I’m doing on my website. And you can still use this type of return visitor to promote your products, sponsored content or affiliate posts. To maximize this boost in traffic, you need to find out the right time to email your list. The standard time most email marketers mention is 10 am. But, then EVERY blogger out there is sending their email at that time. How can your email stand out when your subscriber is being flooded with emails at 10 am? I suggest you find YOUR time for YOUR audience. I play around with my email send time and one time I was late and shot off an email at 3pm. I had no clue that this would result in a massive increase in website traffic. Boost in blog traffic after sending an email at a different time. If you have a product like an eBook, course or printables, you generally create a sales page to share the benefits of your new product. But, with all the new course platforms like Teachable, you can have your sales page on there instead of your blog. And still others, like to create a brand new domain address to host their sales page. I do this for my freelance writing course. But, an easy way to increase more traffic to your website is to create a subdomain and host your course page there. I do this for my traffic building course on this blog, and this page is one of my top 10 posts on Twins Mommy. Let’s back up a minute and start from the beginning. To increase your website traffic, you whole-heartedly need to know your target audience. It’s okay if this takes a while to figure out. For one of my blogs, it took me over a year. But, now that I know, my traffic shot up 488% in one year. A lot of this traffic growth resulted in pivoting my blog niche to focus on one type of audience – mostly pregnant moms. I started creating blog posts just for pregnant moms and postpartum new moms, and my traffic exploded. I like to look to myself to figure out who I want to write for. For Twins Mommy, I started out writing to other work at home moms. I am a work at home mom with little ones, and that’s what I wrote about. But, it wasn’t until I started sharing my blog traffic reports that I attracted a whole new audience of mom bloggers trying to monetize their website. You can also look at your target audience as an earlier part of you. What I mean by that is you are blogging about the steps previous. So, if you are already making money with your blog, your audience is those that want to make money with their blog but don’t know how. If you are a health blogger, you can blog to people that are just starting out eating healthy or exercising for the first time. The “beginner audience” is a popular choice when figuring out your target audience. This is because it’s easier to help them as you already have been through that process and can offer insight. And with your target audience, you can create your audience avatar and figure out what their main challenges and problems are. From there, you position your blog to help them through those challenges. Finally, you can look to yourself again and look at your current challenges and write about that. For example, if your children are entering college, you are facing a new chapter of your life. You can blog about those challenges like downsizing or how to rekindle the spark in marriage or finding ways to save for your retirement. As you’re figuring out these challenges, you can help your audience at the same time. I don’t know about you, but I use Google and Pinterest and even Facebook to find content that will help me in some way or another. Even though I’m a full-time blogger making six figures, I am still learning new tactics and strategies every day. And, a lot of other people use Google and Pinterest to help them learn something new. So, for your blog content, incorporate educational content, rather than inspirational content. A simple way to do this is to break down a huge step into easy to digest tips and frame it in either a list post or a how-to post. And when you do this, go ahead and check out what the search intent is. This can sway a user from clicking a video or question or the #4th option rather than the #1 option. Here is my result for start a capsule wardrobe. Most of the top posts are geared towards starting a capsule wardrobe. The second result’s search intent is to help someone understand what a capsule wardrobe is while helping them start one. So this provides more information. But, what if I wanted a list post on what to put in a capsule wardrobe because I want to start a capsule wardrobe? I don’t see that result, and I would have to spend more time finding that type of content. So, when creating educational content – or any type of content – always look at what the user is seeking. This may mean going to Google and typing in your suggested blog post idea to see what’s out there. Maybe the first page is all list posts. This tells you users want small tips to help them with a big issue. But, you could also say that since there are lists posts, you can just write about one tactic in-depth as a way to stand out. In either case, educational content helps a reader from point A to point B. It provides tips, hacks, ideas, or strategies that are broken down and explained. In November last year, I wrote 8 blog posts. In December I wrote 5. This month I already wrote four, and this post I’m writing will now be #5. I find the months when I write more blog posts, I increase website traffic easily. Some are 6,000 words, others are 2,000 words, and all of them are educational and help someone with a problem they are having. But, if you’re a new blogger or mom blogger, how do you find the time to blog with a full-time job or little kids running around? My #1 best tip is to repurpose content. This means using your own content and repurposing that into a new medium or form of content. 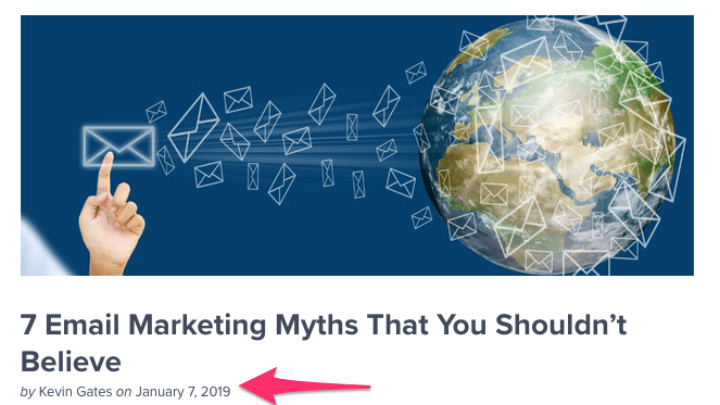 So, blog posts can be a springboard to YouTube videos and an email newsletter you wrote 6 months ago is a great topic for a new blog post. By repurposing content, you end up writing more frequently since you cut your time in half or more by creating new content. External linking is a powerful strategy to help your blog’s authority. External linking refers to linking to outside sources – other people’s blog posts. If your blog is new, Google still needs to understand what your blog is about. They use signals like outbound links to help determine what your niche is and decide if you are a trusted source of content. It’s best to link to other bloggers’ popular content that’s related to your niche. Again, you are strengthening YOUR blog’s trust and authority by linking to other sources in your niche. 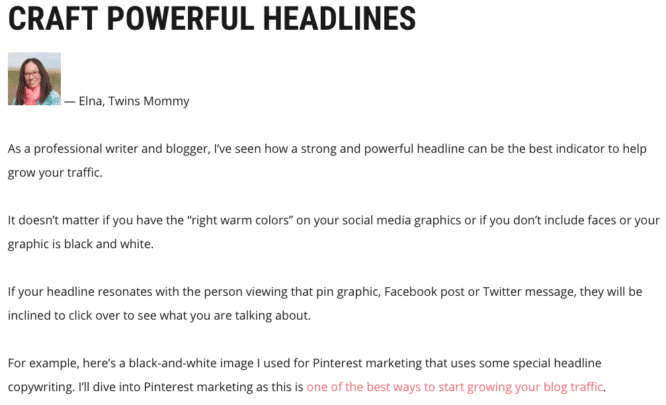 When you have a new blog post, it’s best to interlink your already popular blog posts. This gives some “SEO juice” to your brand new blog post. It just tells Google more about what your new blog post is about from those interlinks. So, make sure to do it the right way, by finding your popular flag-ship content and linking that to your new blog posts. Is it better to write every day for one month and then skip three months and then write every day for one month again? Probably not. The initial traffic you gained from writing every day will stop once there is no new content on your website. It will be like starting over after every long break you have. On an older blog I have, I wrote very inconsistently, and traffic was very low. But, as soon as I started writing more consistently, (as well as promoting it more often) traffic starting growing. Instead, work on organizing your blog posts and creating a plan around your content to write on a regular basis. This means carving out dedicated time and using that time for blog writing. For example, the mornings are a much better time for me to create content than when my twins go to bed at 8pm. So my morning is packed full of writing blog posts, writing emails, outlining client posts and coming up with more topics for my website. But, I also know that life gets in the way and there will be times when I’m not that consistent. That’s okay, I just try to be as consistent as I can and if you’re new try to for at least the first 6 months to a year. After that, you can write less consistently but still frequently (if that makes sense!). For more established blogs you can write once a month and still maintain a ranking in Google and website traffic. On the topic of writing, a way to increase website traffic is to write about one main topic. This is called a core niche and is one of the types of blog niches you can have. Out of all the blogs I have, my core niche website gets the most traffic – and the most organic traffic. Because Google knows what my blog is about and Pinterest knows (i.e. Pinterest is another search engine). And, what’s more important, is that other bloggers know what I blog about. This means other big brands, businesses and bloggers link to my core niche blog. This establishes trust with Google and helps push my blog posts up to the #1 spot or on page one. Also, people just like core niches. Who’s your favorite author? YA? Horror? Sci-fi? I’m sure you have a favorite author because of the niche they write in, right? What about movies? You may really love rom-coms or just movies with Melissa McCarthy. Either way, you have a core favorite author and type of movie. It’s the same with users online. They learn over time the websites that are known for one type of niche topic. For example, it’s a one-stop shop for all things Pinterest marketing, or all things DIY farmhouse decor. How do you establish a core niche? The best way to plan your blog as a niche blog is to find a topic you are passionate about and are willing to write about it for years to come. From there, optimize your website content to appeal to your target audience and help them with the problems in your core niche topic. 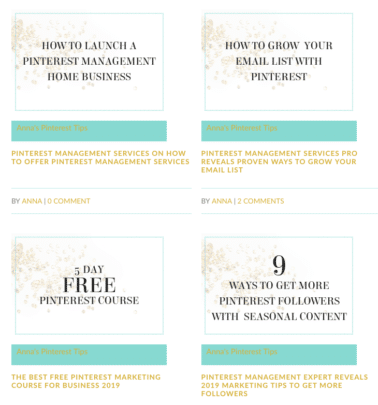 All about Pinterest marketing in one spot. When you do this, your content will naturally start ranking, and others will naturally link to your content. It goes without saying that the educational content you write and the core niche you decide to write about should be helpful content. If it doesn’t help your target readers, they will not share your blog posts or comment on them. But, is it okay if you don’t always write helpful content? Yes, you can write a personal post or something you are itching to write about. This is fine, but your entire blog shouldn’t be inspirational – it should be more helpful than anything. How do you find blog posts that are helpful to your audience? Well, this list to increase website traffic will share specific strategies to find blog topics that will resonate with your audience, so wait for it! People will stay on your blog longer if you break up your blog posts with subheadings, lists, and images. This also means writing shorter sentences and shorter paragraphs. I like to write one sentence paragraphs as do a lot of other bloggers too. But, also be mindful of your line height and content width. This is dependant on your blog’s theme. A shorter content width is easier to read, and it looks more organized to online readers. Derek Halpern suggests that the optimal content width is between 400-600 pixels. An easy way to start your blog post off with the optimal content width is to add your feature image to the side. By breaking up your blog posts this way, it makes it easier for readers to read your content – not skim it – and stay longer on your blog post. 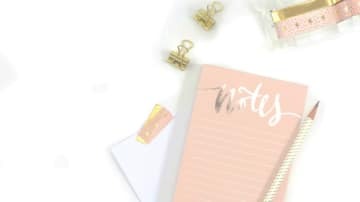 As a new blogger, one of the best ways to increase website traffic is to connect and network with other bloggers in your niche. This is what I did when I first started Twins Mommy. Since I came over from my freelance writing website, I didn’t know many mom bloggers. So what I did was join Facebook groups and got to know other mom bloggers. I also found many using Pinterest and would save their pins. Finally, I joined their email list. These actions helped me get to know other mom bloggers in this niche and over time I could reach out to them. This sets the foundation for a more successful blog over time. And the more you connect with others, the more you grow your network to even start including influencers. For example, I signed up to Tailwind soon after starting Twins Mommy and wrote about using their tool in a few posts. They later ran a promoted pin of one of my posts and even featured me on one of their blog posts. 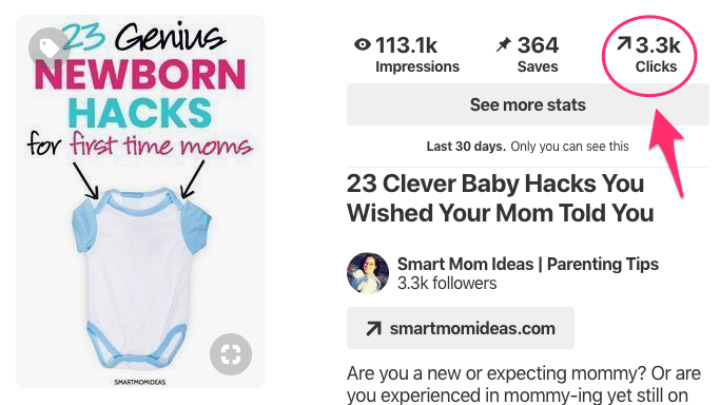 This creates a backlink to my Twins Mommy site and helps strengthen the trust factor with Google (i.e., other bigger more popular websites are linking to Twins Mommy). A powerful way to network with influencers is to start featuring them in your content. I did this early on as another way to connect with other mom bloggers. No one gives up an opportunity to be featured on someone else’s blog post! And doing a round up blog post is the perfect way. For roundups like the ones I mentioned, you don’t need permission to feature the people, tools, services or sites. But, I do suggest you tag the people you featured on social or email letting them know you featured them on your blog post. If you want others to contribute to a round up – answer a question – then I would email that blogger and let them know your plan and ask if they would be willing to contribute. Kristie Hill did just this and asked me if I would love to contribute to an upcoming blog traffic post. I said sure! Her blog post includes big bloggers like Lauren from Create and Go, Ben of Breaking the One Percent, Lena of What Mommy Does and more! This helps grow your brand and be established as a go-to in your niche. The fact that you are on a list with other bigger bloggers – by proxy – makes you more notable. Plus, you get a great backlink with just helps with your blog’s ranking profile. It’s true, many bloggers focus on the current and the future than on the past. But, you have a rich library of old content that can be optimized to help rank better on Google, get more shares on Pinterest and, just revive old content to make it hot and new again. Updating your old blog posts is a highly simple and effective way to increase website traffic – up to 30% or more. And, sometimes you don’t even need to update the actual words of the blog post – just the social media graphic. For example, I wrote a blog post a while back on sites that pay. It had it’s fun on Pinterest and it helped that post rank in Google. But, I forgot about it – as a lot of new bloggers do (shiny object syndrome an’ all!). 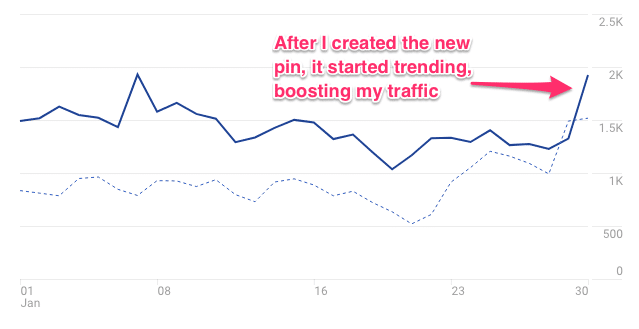 I decided to create a new pin for this post and my traffic and shares shot up. So, simply creating a new pin image can help revive an old blog post. Along with adding the updated date, you can update images in your blog post, thicken your blog post and make it a better blog post than before. Crafting a headline that drives clicks does take practice, but once you got it, it’s easy to replicate. While there are headline templates as well as headline generators, nothing beats a well thought out headline! One thing I immediately noticed is that all of my top performing posts are list posts. This type of post should be one of the first blog posts you should have on your new blog. People love list posts, and they love large list posts. People want to save them and refer back to them later on. The second thing I noticed is that none of these titles are really SEO friendly. There are keywords in those titles, but it’s not the primary feature of these headlines. These headlines are written for people, not search engines. Those words help drive clicks back to my website. Another thing I noticed about these blog titles is that they feature the benefit, not the problem. This is important because people click on pins or Facebook posts when there is something for them. This is the WIIFM factor – what’s in it for me? When your title can show the benefit, it is more likely someone will want to read that post and want to see how it can benefit them. Guest post is an old strategy that many bloggers – new and established – continue to use. Why? Because it’s effective in increasing traffic. Ideally, you want to guest post on a blog that is bigger than yours and with a larger audience. But, those contributor sites are tough to get into. Typically you need to have established yourself as well as guest post on other sites to use as proof you are credible. An easy work around this is to find sites that accept contributors immediately. One is Thrive Global. This site is owned by Arianna Huffington and is a growing community. 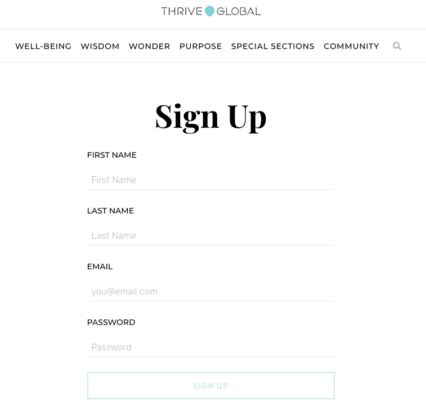 Just go to their sign up page, sign up, and you’re ready to write a blog post. Once you sign up, you have access to their WordPress backend. Simply write your post or copy and paste your post and submit for review. This is an easy way for new bloggers to establish credibility, get a backlink and promote your blog in your author bio. Another way to start guest posting is to guest post on less popular sites, but ones that are bigger (i.e., have more website traffic) than you. Imperfectly Perfect Mama is a site I own and it’s a contributor site. This is an aged domain, and once I took over, and added new pins and more content, traffic boosted. You may think Podcast is so 2017, but they are still holding strong! More and more bloggers are supplementing their blog content with a podcast. And as a blogger wanting to increase website traffic, getting on a podcast may be easier than guest posting and is another way to drive clicks. For this tactic to work, you do need to find very niched-down podcasts that appeal to your target audience. I find the best place to find podcasts to guest “pod” on is in Facebook groups. 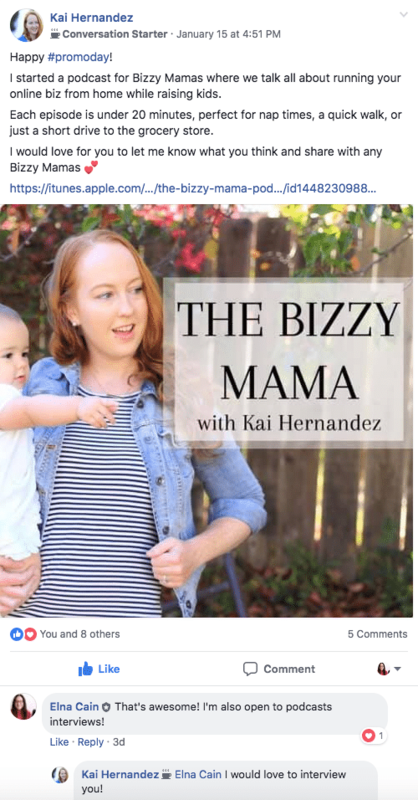 My Mom to Mompreneur Facebook group has a lot of mom bloggers with podcasts, and on our special promo day, they feature them, which always prompts me to ask them if they allow guests on their show. Check your Facebook groups and pay attention to bloggers with a podcast. If they fit your niche, then reach out to them and ask if they need a guest for their show about a particular topic. Podcasting is also a bump up from guest posting because a podcast can be streamed on other sites like Spotify or iTunes and increases your exposure to a new audience. The podcast owner may also create a YouTube video of your show as well as a blog post. So from one piece of content – a podcast – your brand has the potential to be on four other mediums! You reach a new audience – many people prefer to listen rather than read, or it might just be a necessity. Moms are busy during the day which makes it more likely they will listen to a podcast while folding laundry than try to squeeze in uninterrupted time to read a blog post. Google likes new and fresh content. Why not take advantage of that and open up your blog for contributors? This is a great way to get consistent content and help your blogging community by offering new bloggers to guest contribute on your blog. There are different ways to start a contributor blog, but I like when I give the guest access to the backend for the site to submit their post. I’m sure a virtual assistant can handle these tasks, but for now, I’m more than happy to do these tasks amongst my other to-do list items. Long form content doesn’t mean it’s fluff or not valuable. In general, to help you rank in Google and increase website traffic, your long form content should be in-depth guides that answer a particular question. They can also be top tier type of content where you oversee a broad category. Something like this blog post is a top tier post as I’m looking at blog traffic as a collective strategy, rather than focus on one main strategy. What’s great about creating this flag-ship type of ultimate guide is that it creates natural backlinks. This is the best strategy and something I heavily teach in Ready Set Blog for Traffic. Long form content gets shared more and gets linked to more than shorter pieces of blog posts. So, how long is considered long form content? Anything over 1,000 words is standard, and anything over 2,000 words is optimal. Buzzsumo analyzed 100 million articles and found content between 3,000-10,000 words to be the most shared on social media. Should every blog post be long form? Not necessarily. If your niche doesn’t allow it – DIY craft niche – then shorter content with more images do best. However, if your niche is more educational and business related, then having those flagship pieces on your blog should help set the foundation for continuing traffic over the long run. Writing optimized blog posts for Google is slightly different than writing blog posts for social media. You want to take into account keywords that can help you be more visual in the SERPs. This means layering a keyword strategy to help you provide not only highly-valuable blog posts, but also keyword-optimized blog posts. I personally don’t actively optimize my blog post until after a year or more from starting my websites. Since it takes Google 6 months to a year to index your site and remove you from Google sandbox, I focus on creating highly valuable content first. Later, I typically go back to optimize my old blog posts for Google traffic. I’ve done that on all my blogs, and it serves me well. When using a keyword strategy, you want to pick highly searched words that aren’t highly competitive. You can use a free SEO tool like Ubersuggest. 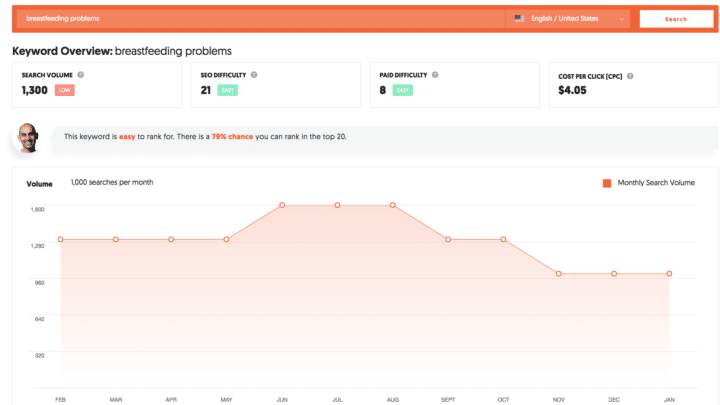 You can use this tool to come up with some blog post ideas that you can easily rank for. 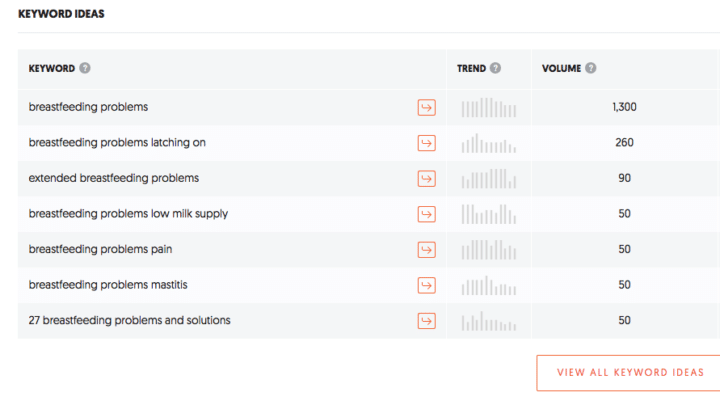 So, for example, “breastfeeding problems” gets around 1,000 searches a month – with the most traffic during the summer – and it’s easy to rank for. With the longtail keywords, you can come up with some blog post ideas. In your post, you would weave in your longtail keywords as a way to optimize your post for ranking. Doing this alone won’t get you on page one, but it’s a start! For more help, check out my blog traffic recipe. Google Console is a free Google tool that you can use to help you find more keywords to rank for and increase website traffic. By plugging in your most popular post and seeing the CTR, average position, total clicks, and impressions, you will get a list of keywords and their impressions and clicks. Find ones with high impressions and low clicks. Those are the keywords you can either add to that existing popular post or create a new blog post from that. I’ve already alluded to this type of content but, it’s important you understand that every blog that you want to eventually make money should have a few ultimate guides. This anchors your blog, helps others know you’re the go-to in your niche and can establish trust quicker with a new audience. These guides are based on your niche. For example, if you want to blog about homeschooling, frugal living and time management, I suggest you create an ultimate guide for all of your categories. Go to Google and type in your category to see what is already ranking in Google. 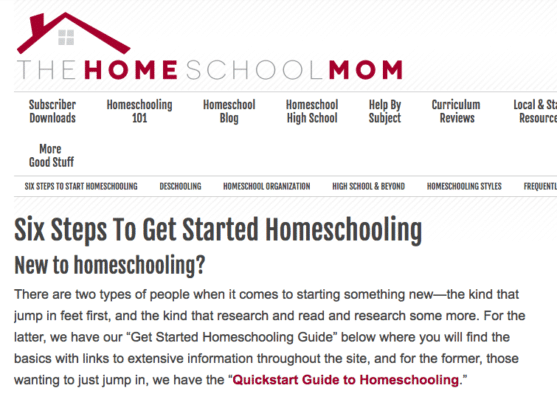 For homeschooling, the Homeschool Mom’s post on how to start homeschooling is ranked #1 in Google. This is considered an ultimate guide as she lays out the steps to start homeschooling and provide resources in her blog posts via interlinking or external linking. So, if you want to create a similar guide, you can peruse the top ranking posts in Google and come up with your own subtopics in this niche. You might notice this blog post doesn’t cover the materials to start homeschooling or what a typical day would be when you homeschool. These can be incorporated into your ultimate guide to making it better and more valuable. Ultimate guides are also helpful for your audience because they can effectively come to one post on your blog and get all the information. As the blog owner, you can also link to your other blog posts within your ultimate guide so that you create a sticky blog. I’m sure you know that there aren’t a lot of new tips and strategies online anymore. There are billions of blogs out there! So, when you have a truly unique idea, hack, tip or strategy, create a blog post about it! This will help grow your brand and help with SEO. People will talk about it, share it, and link to it if it’s highly helpful. Other ways to create unique content is to be more authentic. 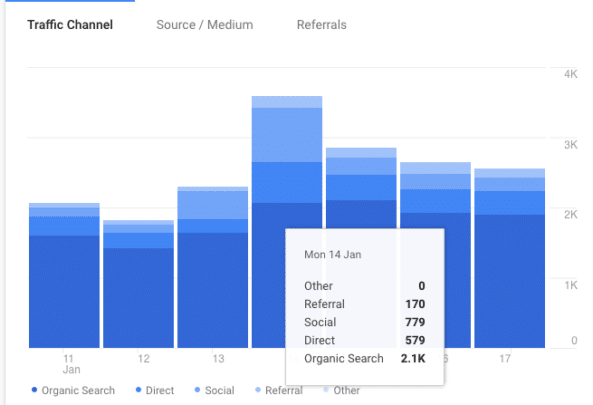 Showcasing your traffic reports or income reports or how your last product launch went are all unique forms of content. I love Google Analytics. In fact, on my other screen, I have Real Time on all day. I like to see my high traffic hours and use that to market more on Pinterest or update my Facebook page. But I also use Google Analytics to check out my most popular posts and create more posts around those topics. This is also a great strategy if you have a lifestyle blog and you want to niche down. Go to Behavior > Site Content > All Pages to view your top posts. Buzzsumo is a free tool that shows you the top posts based on the number of social shares. You can plug in a URL, keyword or blog topic to see if that is popular on social media. You can also plug in a competitor of your blog and see what their popular posts are and use that for organizing and planning your blog posts. Don’t do this to copy your competitor, but to get an idea of the theme or category that is resonating with that blog’s audience. 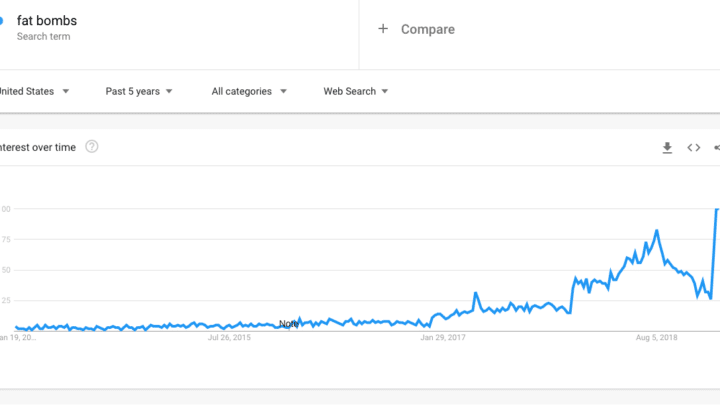 Google Trends is another free Google tool that checks the trends over the years. By looking at a blog topic and seeing if it’s on an upward trend can help increase website traffic. For example, fat bombs are on an upward rise. This tells you that you can write a whole post about fat bombs or include that as a subtopic in a blog post. Let’s dive into Pinterest. 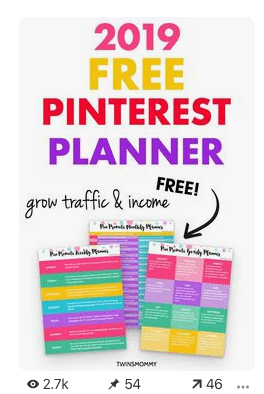 Pinterest is a great platform to grow your blog traffic. It’s considered a search engine, not a social media platform. When you sign up for a business account, you need to fill in your information and start creating boards. 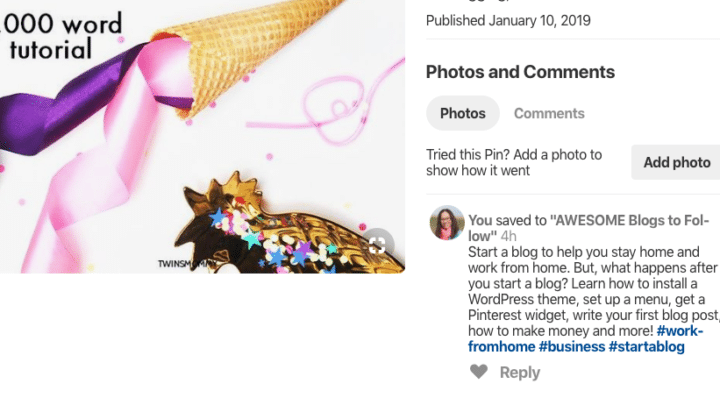 From there you can grab the Save It button to put on your pin images on your blog and start saving your pin graphics onto your Pinterest boards! The traffic tactics below will help you optimize this simple strategy for more clicks. Pinterest SEO is the main way your pins will get noticed, and your profile will get noticed. When filling out your title, you can use keywords. You can check on Pinterest by using the search box to see if it’s a popular keyword. I change my title a lot as I want to see what keywords are the best for my brand. When filling out your profile, you get a small description to share who you are, what you do and how you can help your audience. In that description, I would use keywords. So, if you have a homeschool blog, you might type this into Pinterest to get keyword ideas. I share homeschool tips and tricks for parents. Get homeschool lesson plans and ideas! Your Pinterest boards are one of the most important features of using Pinterest. Since Pinterest doesn’t know your pin when you first pin it, it uses context to help them figure out what you pinned. Over time, Pinterest will understand what your pin about and share it to the right audience. It’s also important to not only name your Pinterest boards but also fill out your Pinterest boards with keywords as well as categorize your boards. After you create a pin, you set the Pin description. This is a place for rich source keywords to help Pinterest push your pin to a broader and broader audience. 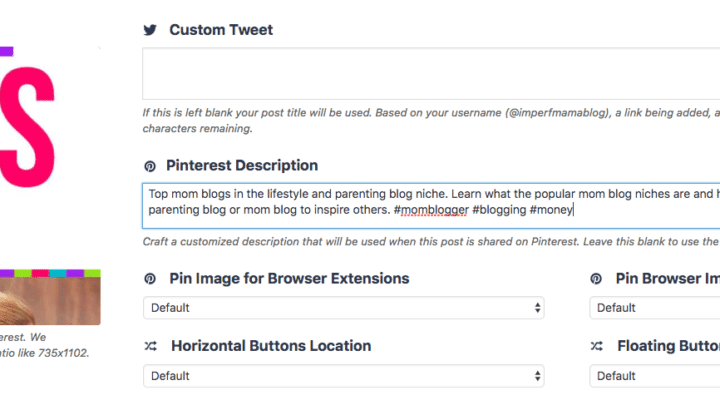 Try to put your main keyword at the front of your pin description or place a keyword that closely matches the name of your Pinterest board that you will save it to. This strengthens the keyword and helps Pinterest understand your pin quicker. Pinterest opened up using hashtags in the Pin description. Hashtags should only be used on new pins, not old pins. You can use up to 20 different hashtags, but it’s not necessary to use that many. I like to use no more than 4 or 5 per pin description. 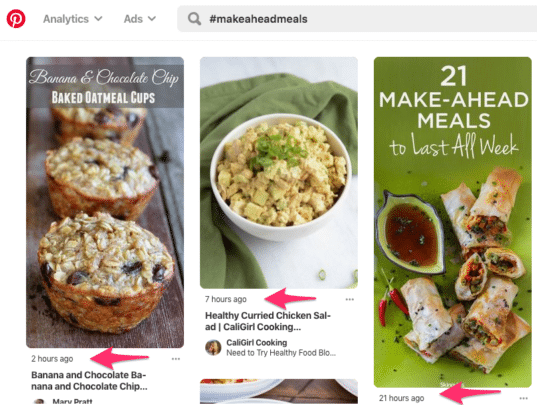 Pinners can use hashtags to search on Pinterest and Pinterest will pull the freshest pins using that specific hashtag. It’s best to use a real picture of you as a way to be more personal and authentic. For some blogs and businesses, it doesn’t make sense, but if you can, use a headshot of you. 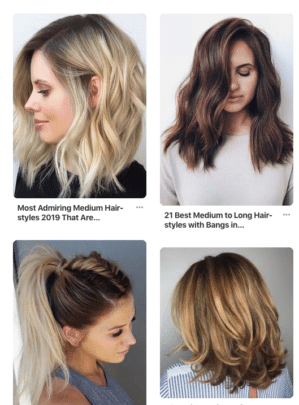 This ups the trust factor and will help you connect with your audience on Pinterest quicker than if you used a logo. 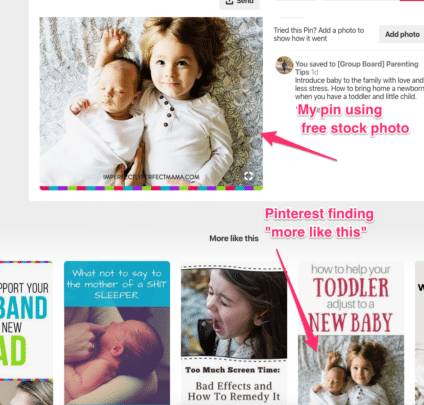 Since Pinterest sees the images you use for your pins, some bloggers say that Pinterest may get confused in understanding your pin when you use a free stock photo that everyone else is using. To bypass this confusion, you can start using paid stock photos, or you can change the angle of free stock photos. I have several Pinterest profiles, and for one of my profiles I only to do paid stock photos, and there was an increase in website traffic. [V]ery light and very dark images are, generally speaking, repinned one-twentieth as often as images with medium lightness. Bright images just do better on Pinterest. Since most pinners are on mobile, you need your pin image to be a photo that’s bright, bold and it pops. A lot of popular pins have no titles on the image. It’s just the image, and those images do very well on Pinterest. Since Pinterest is a visual search platform, people are primarily there to look at images, not read them. For bloggers that blog outside of the lifestyle niche and more digital, how can we share pins with no titles? Divine of Ladies Make Money uses beautiful photos that relate to some of her blog posts. 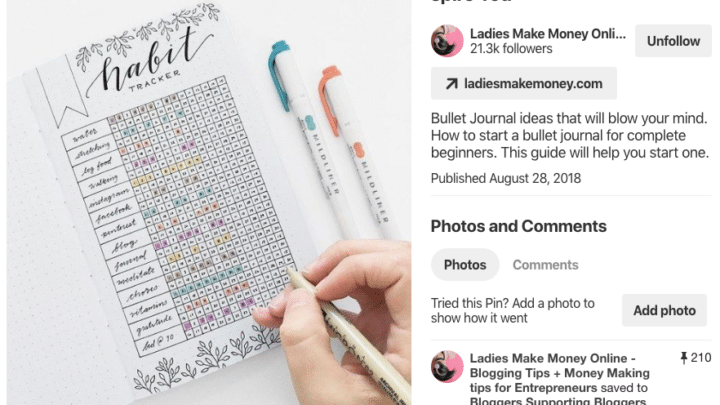 For example, this post about bullet journal ideas doesn’t need a title; it will get saved again and again with just the image of a bullet journal idea. Infographics do well on Pinterest because it’s a visual depiction of a blog post or piece of content. They are longer than standard pins and show graphs, icons and other stats that looks put together. And they can double your traffic easily. Your infographics also don’t need to be highly professional looking or even that pretty! I’m one to say that I’m not great at designing infographics. So, I just end up using templates from Canva. For example, this infographic based off of this post on how to use Pinterest received 1,000 saves and over 100 clicks back to my site. And this is only one copy of my pin. Pinterest has different copies of the same pin based on if others pin this pin from my website or a group board. So, collectively, this infographic will bring me a good chunk of website traffic. Pinners scroll Pinterest and only stop on pins that hold their attention. To boost the likelihood that they stop on your pin, have a catchy title that makes the pinner curious. Using superlatives and strong adjectives can help drive the curiosity up on your pin. On Pinterest there to two types of boards you can save a pin to: personal boards and group boards. Pinterest has mentioned in Facebook Lives that they will no longer prioritize pins from group boards. This means there is more weight on your personal boards. 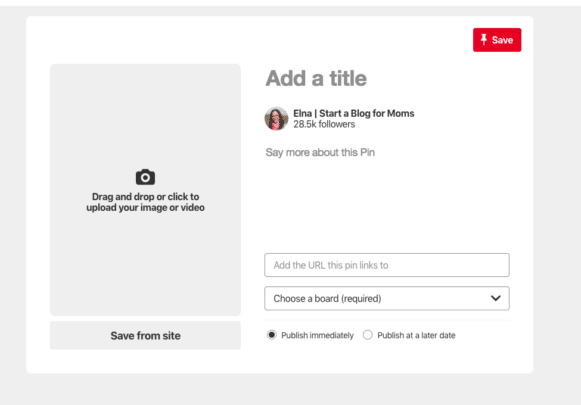 So, when saving pins from your website to Pinterest, save them to a relevant board that’s yours. I just mentioned that Pinterest is no longer prioritizing group boards, so why continue to use them? Because I haven’t seen this happen to my pins. I use group boards for all my Pinterest profiles, and it is helping them reach a wider audience. Group boards are collaborative boards where multiple pinners can pin to. If a Pinner with a lot of followers has a group board, your pins on that board can be seen by those followers. Tailwind is a social automation tool for Pinterest and Instagram. It lets you schedule your pins on autopilot so that you don’t have to spend hours on Pinterest manually pinning your pins. Using Tailwind has helped me increase not only website traffic, but also my Pinterest followers and income. If you need help scheduling your pins on Pinterest, check out my video tutorial. Tailwind has tribes on their platform as a way to share your pins to a wider audience. I’ve noticed that when I share a new pin to Tribes, it is pushed out on Pinterest much quicker than if I scheduled my pin to Tailwind first. You want to give extra attention to your new pins since Pinterest doesn’t know what your pin is about. Once Pinterest gets the right information and knows what your pin is about, Pinterest can show your pin to the right audience and push that pin out more and more. Tailwind has a SmartLoop function where you can loop your pins to a board. 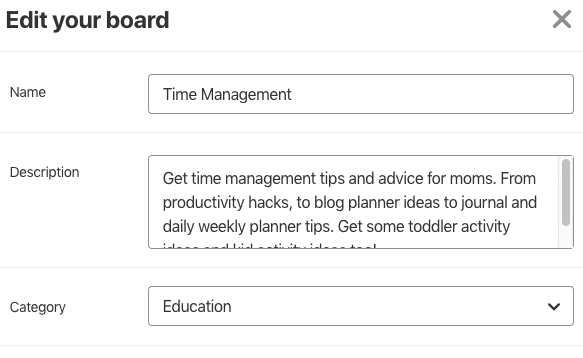 It’s best to use this feature on your own boards and with new Pinterest accounts. 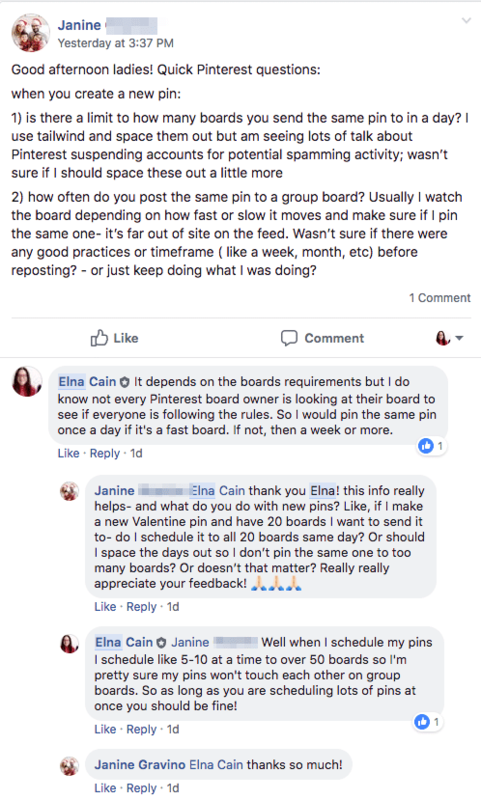 If you don’t have a lot of pins or boards and you aren’t on group boards yet, you don’t want to neglect your Pinterest profile. Pinterest rewards pinners if they are on their profile every day. Tailwind can help you by scheduling or looping your pins every day. By looping your pins, you have a higher chance of more saves and click-throughs. To optimize fresh content on Pinterest, start creating more than one pin image per blog post. 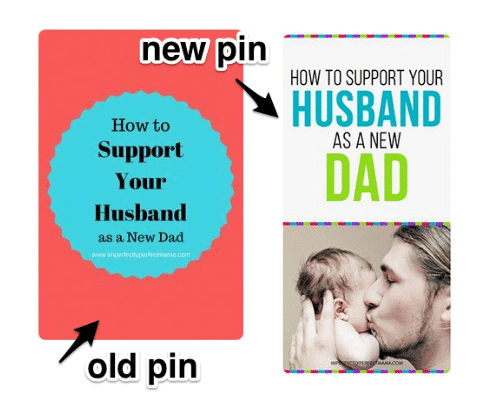 You can use editing tools like Canva to create new pins that are off-brand with different colors and font choices. Some bloggers place alternate pins within the blog post, others hide them and still others upload them right to Pinterest. I upload all my alternate pins to Pinterest. You just drag your pin image, set the URL and description then choose the right board to save it to. I feel that Pinterest wants users engaging on their platform and doing this is one way I engage on Pinterest. By creating alternate pins of the same blog post, you can reach a new audience, and it also acts as an A/B testing situation. You can pin alternate pins and see which ones take off and which ones didn’t. This can help you later on with creating pins for your blog posts. To help you grow your email list and drive more clicks to your website, start creating pins for your lead magnets. Here are six other tips that can help you grow your blog traffic as a new blogger. LinkedIn is like the Facebook for business people. They have a publishing platform called the Pulse, and you can repurpose your old content on there. 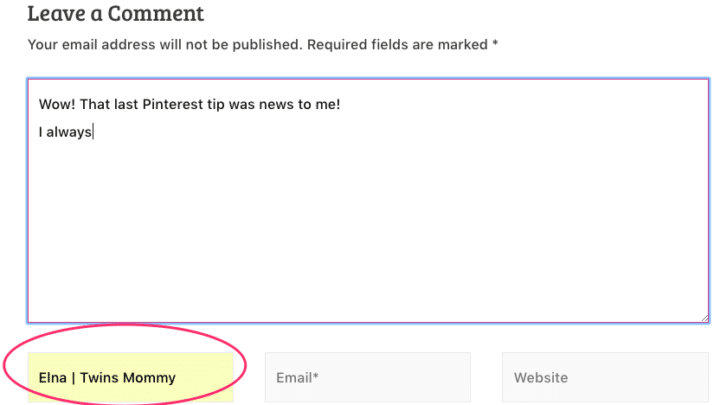 I would annotate the bottom of your article that your article is first published on your blog to ensure no duplication. This just opens the doors to get new eyes and hopefully more saves on your content! Similar to LinkedIn, start repurposing your blog content on Medium – a free blogging platform. What’a great about using Medium to repurpose your content is that Medium has it’s own built-in audience. It’s easy to sign up and start creating content or repurposing old content from your website. I don’t know about you, but I feel people Like a Facebook page because they want information about that brand, business or blogger. That is why most of the content I share on my Facebook page is from my blog or about me. I do occasionally share videos and other helpful content from 3rd party bloggers, but it’s generally my content. It hasn’t hurt my reach or my Likes. So, don’t be shy about posting your blog posts, landing pages, YouTube videos and more! Facebook prioritizes native posts – Facebook Lives – over other types of posts on your Facebook page. Take advantage of this to help grow your reach by doing more Lives. But, to optimize each Facebook Live, link to a freebie you are offering or your latest post in the comments – not in your post as you want your Facebook live to appear as a native post. Being on different platforms can help you reach more people and increase website traffic. You don’t have to be a YouTube professional to start a channel. I don’t even make YouTube videos. Instead, I repurpose my Facebook Lives into YouTube videos. Facebook is a great place to really get to know your target audience and help them. 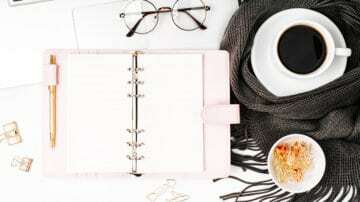 I have a growing Facebook Group for moms that want to make money blogging, and I do my best to go into my group every day and help moms on a 1:1 basis. This humanizes you and makes people trust you more by being available. There ya go! Fifty-four simple and effective ways to increase website traffic and help you make money blogging. Over to you – what is your best tactic for growing your blog traffic? I’d love to hear your tips in the comments! Elna! Thank you for such an in depth guide! I actually have this bookmarked in my phone so I have it for quick refer access! I plan to use your guide to set up a sort of blog maintenance schedule to help keep things on track to help maximize my traffic. Right now it hard for me to niche down haha. I love writing about my travels and general lifestyle posts. In this case would you recommend a static page highlighting each category or do you notice that home pages with recent posts tend to drive and keep traffic? Again thanks for all you do and helping other moms! Thanks for bookmarking this post! It is a monster of a post! Niching down is a good goal to have but if you feel your lifestyle brand is more YOU, then keep it! Not sure about your question. Do you mean do static pages vs blog roll bring more traffic? Not sure. I just know a static page that’s frequently updated is fine. So for Twins Mommy I do have a blog at the bottom so it’s always fresh content and updated frequently. I’m definitely going to try a bunch of these! Awesome! I hope you increase your website traffic! Elna, I love it when pro bloggers write how-to posts that are highly highly valuable to their readers. This one is top notch … as you will see by how I share my NAME and blog with this comment. What a brilliant idea that I could never have thought of on my own EVER. This one is getting pinned all over the place. I love sharing content that really helps people. You’re welcome! So happy you enjoyed this LONG blog post! 🙂 So happy you are using a traffic tip from the post! These are wonderful tips and very actionable. 🙂 Writing stuff is cool, but promotion and increasing traffic was always a struggle for me. I’m definitely determined to invest in upgrading my skills of promoting my content without social media. All the best! Thanks so much! Glad you enjoyed this content strategy for website traffic! It’s a great guide, it helps me not to stop, I still have a lot to learn, thank you very much. That’s great! I know blogging is a challenge and sometimes we slow down and stop all together. But ways to grow blog traffic is a steady process! Good luck! You’ve knocked it out of the park once again! These are GREAT tips. I’ve pinned this. I know I will be going back to this post many times. I know this had to have taken a lot of time. Thank you for putting this post together! Invaluable information. Thank you so much! Yes, I did spend a bit more time on this post than I normally do 🙂 But I love blogging about how to increase website traffic! It’s my bread and butter! So happy you found good tidbits to help you grow your blog! Thanks! Glad you enjoyed this post on increasing your website traffic! Wow! Thanks for your kind words! Yes, marketing takes time to understand, try and tweak! Have fun growing your blog traffic!!! I’m so happy! Yes website traffic is a challenge to grow as a newbie. I’m hoping these tips are easy for any one to implement and start! Thank you so much for stopping by! Thanks so much for commenting and sharing this post. I hope this post can help you increase your blog traffic quickly! Good luck! Wow. This is really great stuff. I just stumbled across this on Pinterest. (proving the power of that venue!) I have been blogging for over 10 years and listen to Gael and Mark too, so most of it was just refresher for me. But your list was exceptionally well written, complete and compelling. I actually thought pretty hard to come up with something that I could say, “Hey I got one more thing for you” and came up blank. So kudos to you! Thanks! This is one of my pillar posts I feel as it’s compiled with years of working increasing website traffic for all my blogs! I’m so happy you found this post on Pinterest! Love marketing my posts on that platform! Thanks again for your compliment on my writing. I’m also a freelance writer and it’s something I take time to structure and format and ensure it’s easy to read and engaging! If you ever need help you can email me or find me on social! Thanks a lot for this very long post! I’m printing it to read tomorrow with a nice cuppa. It has some good reminders of ideas I knew of but had forgotten in the midst of being busy. I appreciate the reminder, particularly as I’m super busy getting organized to grow my blog. I’m very happy to discover new ideas that I didn’t know of as well. Love your writing style. I’ll surely be browsing through your blog more in the future. Awesome! I hope you have enough ink 🙂 Glad you found some old tactics that you can use again. I love exploring how to increase website traffic and having a post with a lot of resources is great to add to your swipe file! Enjoy your reading and cuppa! Wow, these were some amazing tips. Particularly the ones about SEO were completely new to me, so thanks. Running all those blogs, replying to comments, engaging on social media and all of that while being a mom. Bravo! Even though this is nothing new, it is still good to refresh my memory. I am going to focus on guest blogging to get more exposure and traffic, along with growing my accounts on Pinterest, Instagram and Twitter. It’s a shame that you don’t accept guest posts, because I would l love to write one for your blog. Anyway, keep sharing good content and I will keep coming back. Thanks for stopping over. That’s a great strategy to increase website traffic by guest posting and promoting more on social media! Have fun! What an amazing resource. I can’t wait to dive in and read every last drop, I mean word. Thanks so much! Glad you found some tips to grow your blog. I had to learn the hard way and try different tactics but the ones in this post are legit! I took half an hour reading this. Was it worth it? Heck yes! I learned so many new ways (that I haven’t heard of) on improving my blog traffic. This is why I love reading your blog, Elna! Oh my! I’m soo happy it was well worth the 30 minutes of reading this post! 🙂 Thank you so much for being invested and staying with it! Increasing your website traffic doesn’t happen overnight, but you can work on it each day! Thanks for stopping by! Elna, plenty of info here, as usual. My blogs are new, but I plan to make use of all of the tips here. Keep it up :). Thanks so much! Glad you found some tips to help you increase your website traffic as a new blogger! Brilliant list and what a great mega post! Has just scheduled/pinned this. Great point, by the way, regards last updated date as I do forget to do that sometimes. Will catch your other pins on Pinterest! Nice one. Glad you enjoyed it! Yes, this was a mega in-depth guide for sure on increasing website traffic. It’s my favorite blogging topic for sure! I love being a part of your facebook group and all the helpful information. I am saving this post to truly go over everything again. I do many of these things but some I never thought of. I never tried to do pins with no words and only an image. Also, I’ve never done a pin with an infographic. I am going to try that today. That means a lot! So glad you’re enjoying the Mom to Mompreneur Facebook group! Yes, bookmarking this post is a must for sure! Have fun doing all the tips to grow your traffic! Wow! This is such an amazing post. Thank you so much for putting so much effort and energy into this. You have given so many incredible strategies. I am really gonna try them out. Awesome! I’m glad you found these tactics to increase your website traffic helpful and doable! Have fun growing your blog! Elna, this is awesome! Bookmarking this to refer back to. I’m going to do some article updating, so I’ll definitely use the “last updated date” and perhaps add another pinnable image to some of my evergreen content. Aww thanks so much! Good luck with your posts and updating them 🙂 Love your blog!!! I’m excited to come across some fresh new ideas on how to boost traffic! You always have the best content that can be put into action! You’re welcome! Yes, these traffic tips are awesome and can be applied today to increase your website traffic! This is literally THE MOST HELPFUL post on how to increase traffic. This is getting bookmarked. I will have to keep referring to it and make sure I do most if not everything you outlined. Thank you for sharing this very well laid out post. Wow! Thank you so much! I LOVE LOVE LOVE blogging and traffic building and I love helping others know that too! I’m glad this post will help grow your traffic! Thank you for bookmarking it! 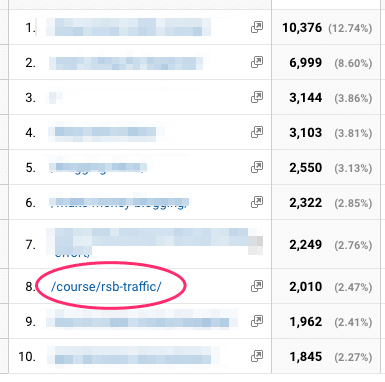 This is the most helpful post I’ve read on growing my blog traffic to date. Thank you for all these amazing tips! I will be reviewing this often in 2019. Excellent tips!! So appreciate this!!!! Thanks so much! Glad you found some tips to increase website traffic to grow your blog up and up! Wow! This big list is amazing. I’m going to follow them like a step-step-by-step manual. It’s easy to grasp and it opened up a plethora of ideas for me on increasing website traffic. It’s simply astonishing how you made it all simple to read and follow. I think it’s really going to help me a lot. It’s totally worth reading this far! Aw! Thanks! Glad you found these blog traffic tips helpful. Love your blog as I mentioned another response to your comment! These tips to increase website traffic will help you for sure! Thank you, Elna. I had just started updating older blog posts and was thrilled when I read this article and learned about the post update plugin. First post now updated and 20 more to go. Thanks ever so much. I appreciate the free content you share and I think your website looks fab! Thanks so much! Glad you enjoyed this website. Yes, updating your older blog posts is a great way to fix any broken links and improve the blog post for sure! Thank you for the info. I had wondered if I was making a blogging mistake by commenting on related blog post and saying my blog (www.thediynuts.com). Thank you for telling me that it is okay to do that! Of course it is! In your comment you can put your URL with your name no problem! I’ve been blogging since 2012 and forgot about some of these! Thanks for compiling these traffic tips. That’s awesome! So glad an established blogger found some tips to increase website traffic. Yes, there are a ton of traffic tips out there, but not many of them work well. I found these ones really do impact your growth as a blogger! This is so incredibly helpful. I’m slowly working my way through this list and doing every single one of these things. Thank you. It’s really really helpful to have a map when the blogging world as a new blogger seems super overwhelming! It’s hard to pick priorities and this helps. So glad this post was helpful! Yes, there are so many ways to grow your bog traffic but I like to find the ones that really make an impact you know! Good luck! These are all great tips! Ive just started my blog and am always looking for things I can do to increase my traffic! That’s awesome! To increase your website traffic as a new blogger takes a lot of consistent work ahead of you! Have fun! Wow!!! I love this Elna! Definitely one of the most comprehensive list of concrete action steps for more blog traffic! Thank you so much! Big fan here! So glad you found this post on blog traffic tips helpful. Blogging is hard and increasing your website traffic is usually the first step to succeeding (along with cultivating a good email list!). Wow I feel like I just stumbled on a gold mine. Such wonderful tips , I love the tip about using the upload date instead of the published date. You’re amazing! Aww thanks so much! You’re soo kind! So glad you found tips to help you increase website traffic. I know when I first started blogging, I had no idea how to grow my blog traffic. But, over time I learned there are a lot of little things that can totally help! Have fun trying these tactics out! Thank you for taking the time to put this together! Your strategies have already helped me so much. I plan on going down the list one by one! Thanks so much! You’re too kind! I’m so happy to hear that these strategies have helped you with increasing your website traffic! Yes, go through the list one by one and let me know how it goes! That’s awesome to hear! Glad you found these traffic tips to grow your blog helpful! Thanks for sharing…guess you spend a great deal of time coming up with posts like like this one? The idea popped in my head and I just kept writing tips and more strategies. I had 57 at one point but merged many of them or decided it wasn’t worth writing about as a whole sup topic. So, it does take time to outline the post and I used the same process for my client pieces with making sure I have the right stats too! Superb and highly useful content Elna. Thank you! That’s awesome and thanks so much! So hoping that you will increase website traffic back to your blog! You can do it mama! Awesome! Try incorporating more tips from this list to help you get that blog traffic up! Good luck and I’m here for ya! Great advice, I immediately went and increased my font size. Already my blog looks better to me!!! Yes! That’s awesome. I love reading blogs that are easy for me and having a good font size and line height really does help make your blog more sticky! Thanks for the tips, Elna. I always learn something from your articles!!! You’re so welcome! I’m glad you found some tips to help you increase your website traffic easily! It just takes patience and trying new tactics! Wow. Thank you so much. This is the best information I have read regarding increasing traffic. I have read through it once and cannot wait to go through line by line and really implement what you shared. I really appreciate your willingness to share your knowledge! Thanks so much! That means a lot to me! Make this year the year to increase website traffic and start making money blogging for sure! I’m here mama to help you through it all! This is an amazingly doable list. Except for starting a Youtube channel, I’m going to try all of these. 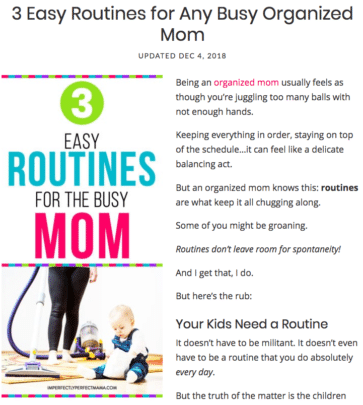 I’m not a mom (so I’m wondering what I’m doing on a mom blog), but I do find blogging a bit tedious, never having enough time for it and mostly coming off and on due to discouragement of being around for so long and yet having little (traffic and earning)to show for. But I’m determined this year to make the most of my blogging career and this tips comes in handy. P.S. I bought your course (Ready Set Blog For Traffic) on Teachable late 2017. Is it possible that I can still access it? I’m wondering if it expires since I only completed the first 2 modules and haven’t logged on to my teachable account since then. Thanks so much! Yes, this is a “mom blog” but I do give you blogging tips and how to make money blogging as well as ways to increase blog traffic. I do tailor my content for mom bloggers though! Thanks for purchasing my course, Ready Set Blog for Traffic. 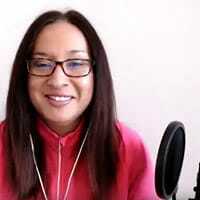 It did go through a big update in late 2018 so I would jump and check out the new module and video lessons on SEO in particular and more on Pinterest marketing for RIHGT NOW! Thank you for these tips. I just made several changes on my site, so I’m interested in how the last updated date added to the visible text will help SEO. Great list though. Working through them all! Thanks so much! What a great niche you have! With hard work, you can increase your website traffic! Hang in there! Thanks so much! Glad you enjoyed this mega traffic post 🙂 The New Year has inspired me soo much to do lots of writing! I love writing soo much and helping others so I’m happy this post will help you with your blog traffic! Thank you!!! #1 is what I was just going to ask you about. 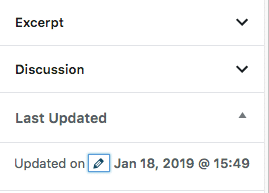 I just republished a blog that I had made significant edits to because I didn’t know how to do the last updated edit date lol! Yes the harder way is the best way to do the last updated site so the post I linked to walks you through that but the WP plugin is a good second! Awesome tips thanks Elna! Such a comprehensive list to work from. Video is the one thing I need to start focusing on! Thanks so much! Yes, video gets bigger and bigger as each year passes! But I still feel writing will be a strong content marketing strategy too! Amazing mega post! I tend to write long post naturally and I’m always trying to cut them down. But, I see that as long as you’re providing the helpful information that people want to know then it really doesn’t matter if the post is long. So many great tips! I’ll have to keep referring back to this one, lol! Yes! Long form content that’s valuable and helpful advice will resonate well with an audience and help increase website traffic! So don’t cut yourself! Write and write some more! Thank you Elna, such a comprehensive post! And really useful, I love how you explain everything in simple and actionable terms. Love it! You’re so welcome! Glad you enjoyed this post! Yes, growing your blog traffic seems like a HUGE mountain to climb, but if you approach it as a way to serve your audience and help them, it does get easier! Thank you so much for sharing these tips! I’ve been struggling with growing my blog traffic, so this has been such a helpful find. Can’t wait to try these solutions! So glad you found this post helpful! Yes, trying to increase website traffic is hard! It didn’t click for me until many years after I started blogging! Let me know how your blog traffic is after trying these tactics! Holy Elna! Amazing tips! So many that I wouldn’t have thought of. I’m re-branding my blog and changing up the niche a bit (bit still including my blogging/biz tips), so these will come in super handy! I’ve pinned this, tweeted, and will share in my FB group when I get on my laptop. 🙂 It’s pure gold – awesome job! Aww! Thanks so much for sharing and tweeting this post! It means a lot to me! That’s cool you’re rebranding!! Can’t wait to see it when it’s done! What a fabulous list. Thanks so much for sharing. Its so incredibly generous of you to share all these goodies. You’re welcome! So glad you found some ways to increase website traffic for your blog! Try a few of these tips and if they are helping you, start layering more strategies! Aww! Thanks so much for coming over! 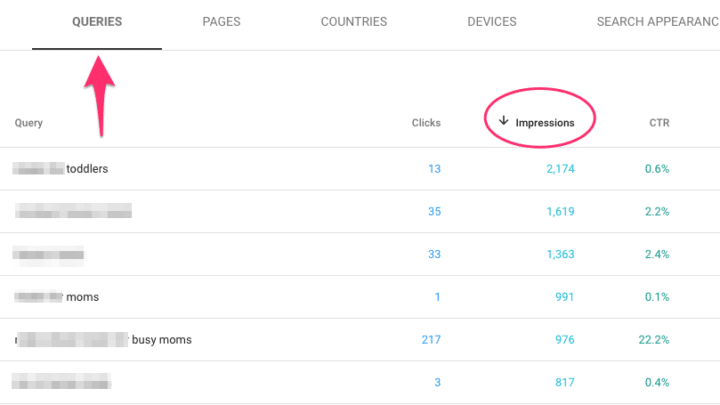 Yes, increasing your website traffic is a challenge when you’re a mom. Those kiddos, right 😀 It does get easier mama! Have fun and prioritize!